Got my info messed up and chiong all the way to Times @ Funan last nite for nothing. 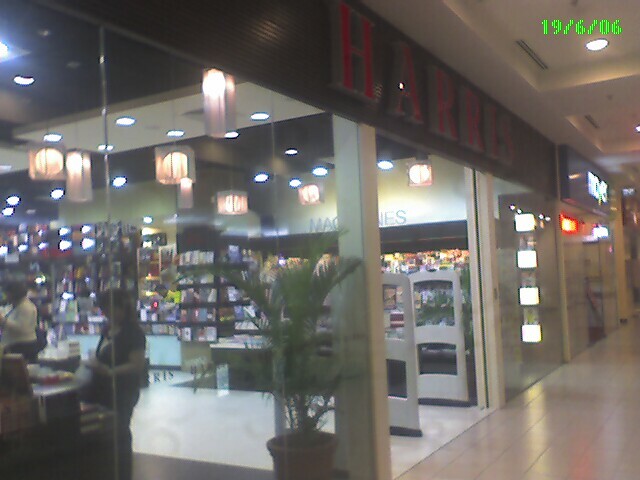 2. then they told me that Times @ Funan had some copies. 2. The 20% storewide discount ended last weekend. On another note, I've just realised that Times Bookstore staff are mostly very very very nice and helpful. Not as polish as Borders perhaps, but they dont have that bored snobbish look either. As usual, we celebrated 1 day ahead of the actual day. Dinner at Pepper's Lunch at Scotts Lido. I had the Loin Steak set w rice + green tea (without sugar), he had the Beef slice + Hamburger Combo set w rice + ice lemon tea, and we shared a spicy tuna salad. It struck me that we should have had 1 set with the rice and the other with the soup, just to try... next time? - turn QUICKLY! they cook FAST!!! - place cooked pieces ON TOP OF THE VEG to stop it from cooking further! and oh~ the veg consist of a whole bunch of beansprouts, 2 slice of carrot and 3 pieces of long bean. if you dont like beansprouts... you're out of luck. the veg cook well with the soya and garlic sauce tho', giving it a very good yasai yaki taste. it was a decent meal, costing us only about $36 in all. It was Hokkaido festival at Isetan, and we bought a piece of Fresh Cambert Cheese Cake from the supermarket to share over our coffees from McCafe outside. And then we caught X-Men 3- the Last Stand. - "what's the blue guy's powers?" - "She so strong, he can fight her meh?" when Storm asked Wolverine if he can "do it". okaaaay, i still love him. Going through the list, i have read some of them some time or other. Others i have not even heard of, and those i hope to read. 100. The Magnificent Ambersons by Booth Tarkington. 9 out of 100... not too shabby i suppose. Ok, waitaminute. If all these authors were included in the list of 100 books, i'm probably done by now. LOL. 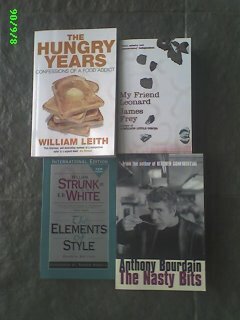 i'll work out a list of must read but UNREAD books for myself. There are several books that i want to read, but i can't. Not yet anyway. 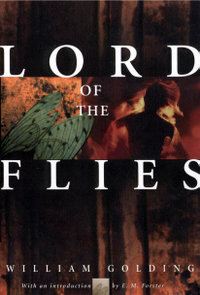 I've read the book once when i was a kid, and then watched a movie adaption, and it scarred me so much. The cruelty, the hopelessness and the helplessness. There had been several times where i almost picked it up from bookstores, libraries, but i've always put it down at the end. I want to read it again, but have not found the courage yet... it is stupid, cos i know the ending. Had dinner at Canton Wok at 382 Joo Chiat Road. Flashy sign board with huge poster of Chef Kang with the restuarant in an old style stand alone bangalow (errrr... not the colonial kind at Rochester Park hor...), with seating in the main hall of the bungalow with aircon/ 2 VIP rooms with aircon / outside the main door of the bungalow with fan and aircon air from all/ and if you are unlucky, the tentage next to the car park. There was a car park for maybe 10 cars? Jockey is available (free service) but they dont wear the restuarant's uniform, so it was kinda scary giving our car keys to akin-to-any-stranger... Otherwise, you can wait (long long) and park along Joo Chiat Road yourself. We made a reservation, and there were no seats anywhere when we got there. Chef Kang was there to hello-hello and spoke nicely to us in cantonese "吾好意思,就好,有人买紧单,就有位啦,等一静间了呵." (So sorry, somebody's paying and there will be seats soon, dont mind waiting for awhile). Nice... And in anycase, we didnt wait more than 5 min, seeing that it was almost 8pm when we got there. The wall behind the main counter in the hall was decorated with medals and plaques and citations to the celebrity-award-winning-media featured-food committee Chef Kang, and the more important ones were printed behind his name card. I dunno, could be the OTT effect, but i was inclined to take them with a pinch of salt. - Pork Rib in 2 style - honey glazed and coffee ($20). The honey glazed one was forgettable, but the coffe one was quite good. And most interestingly, the pork rib were the complete with skin + layer of fat + layer of meat + cripsy bit at the end type. - Deep Fried Eggplant with pork floss ($12). Really deep fried thin sliced cripsy eggplant here, not the cripsy on the outside and mushy on the inside variety (which i prefer), but it was a hit with the kids. a tad oily though. - Toufu Dish ($12). unremarkable... 'nuff said. - 3 deep fried + 2 steam buns ($5) for the fun haha. These came in triangle shapes... the deep fried ones were better. i'm not often inclined to post links to news/ quizzes/ blogs/ videos/ whatnots, but i felt i had to post this video, cos it had wow'ed me and it makes me happy. The simplicity, the music, the jubilant dancing, the LOCATIONS! i pulled out a book from my carry on while waiting for the plane to land on a recent trip, and my companion took a look and exclaimed "whoa, you reading ah? what you read huh?" the first was easier, i read anything from 1 book a month snatching time from where-ever to maybe 16 books (borrowed from the library) a month, and i most times have various books unfinished waiting to to be picked up and to be finished off, depending on mood. the second one was tougher as i rattled through the list of genres and authors, all i ended up was telling her that i read widely and almost indiscrimately, AND i'm still thinking about the list now. - Health/ Medical - Highly Recommends "How We Die"
and lots more. LOTS more, WAAAAAY LOTS more. 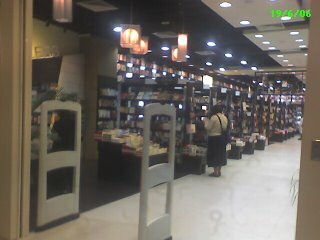 i cant imagine a better way to spend an afternoon shopping for books either in a bookstore or a library. the buuny-shaped 660cc, 3-cylinder intercooler-turbocharged MIVEC engine, automatic four-wheel-drive hatchback, keicar class Mitsubishi i with rear enginer layout complete with xenon headlights, air conditioning, power windows, twin airbags, keyless entry and a hard-disk-based navigation unit AND 3l per 100km fuel consumption. i want 1 in red with grey interiors! arrived at Great World City too early for a dinner at Kuriya last nite. went looking around and chanced on a new bookstore called HARRIS. and the perfunctionary stationary for a book store in an office building. unfortunate abt the unsmiling staff tho... maybe they only smile at pp who actually buys stuff. a fine Jap dining resturant in very classy settings. we had a private room and the chef even came in to say hi. we had lots of sake, 2 salad dishes, sashimi (i actually tried something new, some kind of thick colorless raw fish skin... well, it tasted better than i'm making it sound), a fried/ dried kinda chip made with a layer of small whole fish, soup and yakitori. whats worst than leaving 2 sick kiddies to an overseas work trip? it is often worst for everybody when kiddies get sick. simple. the powers that be really ought to invent medication in the form of chewy jellybean bears, we parents will pay 10 times the money so that our kiddies will eat them with less fuss, and perhaps ask for a second helping, while we parents will have to gently tell them, "no, darling, you cant have more medicine." been travelling a little too much this year. tiring. not just the pre-work, the flying, the trip itself, the drinking, the post-work, and the regular work that gets piled up. jaded too. like there is nothing new under the sun. i dont remember the last time actually feeling excited about anything about visiting a new country, tasting new food, seeing new sights. Happy, yes. Like visiting Yu Yuan in Shanghai, but excited? nahhh. then it struck me, long gone are the days that i used to collect the boarding passes of places i've travelled to. these days, i almost lose them as soon as i get to my seat, or i use them as book marks for the book i happen to be reading on the plane, or whatever. jaded. not just a song by areosmith. was it that sad a song too? The longest work trip to BKK yet. Chang Beer actually sponsored free live world cup matches on free-to-air TV channels, and at least 1 channel for all matches. Cool that there were no crawler ads, no annoying logo at the top corner of screen. I didnt even mind the Thai commentary. The only prob was that ALLLLL the F-T-A channels were showing the Royal celebrations of the Thai King's 60th year of ascension to the throne the whole time from 9-12 Jun! groan. We actually managed to accomplish more than we had expected (but less than we had hoped). Unforunately, a deal was loop-sided that 1 side gain more than the other even tho i was hoping to play fair, but what to do? i was out gunned and out numbered. Drinking was Heavy as usual, red wine, whisky and brandy, bad. One of the dinner was at Log House where they had different areas serving Tepanyaki, BBQ, sushi/ sashimi counter. We had the tepanyaki buffet set and ate it right in front of the TV, showing the Ecuador - Costa Rica match. Both were boring, with the food faring the poorer. Seriously, i dont get tepanyaki, chopped food sprinkled with salt and pepper and garlic and cooked over a hot plate with lots of chink-chink-chang-chang spatula and fork work with some acrobatic throw in... urgh. longest work trip to BKK by far, 13th ~ 16th June 06. Lots to cover with almost no hope of resolving everything. And then the weekend burnt to prepare for presentation on Mon to big shot, unless i somehow manage to finish the presentation while in BKK... which means lugging lots of stuff there. AND the worst bit... no world cup in the hotel that i'll be putting up in. GROAN. Rushed from work to meet family for dinner at 721 Tiong Bahru (off Beo Cresent). An air-con'd eatery at level 1 of a row of 2 storey shop houses, right in the middle of those where the 1st 2 serves teochew porridge in the dead of the night for pp after pub/ ktv hours. Hmmm... after a hiatus of many many years since school days, the migraines are coming back, fast and furious. More medication: Caffox and Thamadol, stronger than the ponstan and synflex that i'm usually prescribed for "simpler" headaches. Also discussed the possibility of Chronic Fatique Syndrome with the doc since i get "nap attacks" for times when my body system shut down, which may take me out for anything between 3 to 6 hours. But doc says that the underlying courses of CFS run into the 100s and the symtoms must be present persistently for over a month; and for pp my profile, he thinks it must be stress + not enough rest + overworked induced migraine and fatique, and advised me to take a break. a.... B R E A K ? hmmph. right. i also know how to say. 4. The Hungry Years - More expose! even on the atkin diet. 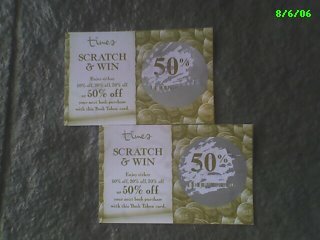 There was a promo for scratch and win card which you can get 20%, 30% or 50% discount cards for every $30 nett spending, and I got TWO 50% discount cards! on the other hand, i might be able to cramp some exercise time there if the hotel gym has cycling machines, was told by Philip from SgRunners that this might help with the ankle rehab while training the quads.